Hosiery: Do I Need Them? I have great legs but my ankles swell by the end of the day! I have big tortuous varicose veins all over my legs! I'm an expectant mom... my legs, ankles and feet hurt and swell! I am over 40 and my legs/ankles seem to be swelling! I have diabetes. Can compression stockings save my legs? I sit all day at work, and by the end of the day my legs are swollen! I have been told that I need compression stockings! If you fall into one of the above categories, you may be a candidate for Gradient Compression Hosiery, or Compression Stockings. ... You might be a candidate. 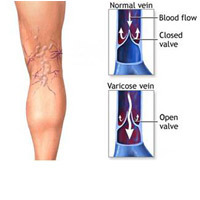 How can gradient compression stockings help? Most extended health insurance plans cover gradient compression stockings on the prescription of a chiropractor or your doctor, often covering the cost of multiple pairs per year. The price of compression hosiery varies depending on the amount of compression and the type of sock/stocking. Please check your insurance policy details and contact us if you have any questions. Advanced Healthcare is a distributor of Jobst - Medical Gradient Compression Hosiery. We will measure your legs and provide you with excellent selection and value. Please email (click here) or call Advanced Healthcare today at (416) 633-3000 to make an appointment with Dr. Pisarek for your evaluation. Please note: It is always recommended to consult your health care professional, like Dr. Pisarek, to determine the appropriate medical gradient hosiery and compression for your needs.